DETAILS: This personalized NFL themed ID tag necklace is personalized, sporty, and stylish. 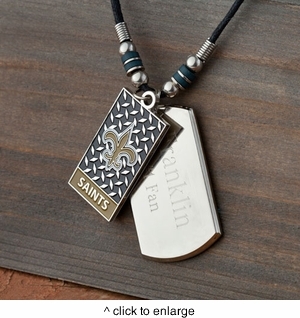 It features a custom, polished dog tag style ID tag with two lines of customizable text up to 20 characters, a cool NFL team charm, and stylish beads on an attractive rope chain. Perfect for men and boys of all ages, it makes a great personalized gift for any occasion. Not suitable for children 12 and under. Size NFL Pendant: 1 1/2" x 3/4", Dog Tag: 2" x 1 1/16" with 10" Rope with clasp. MARKETING: NFL Fans, Men, Father's day and more!